Your Reaction: What did you think of Verdi's Les Vêpres siciliennes 2017? 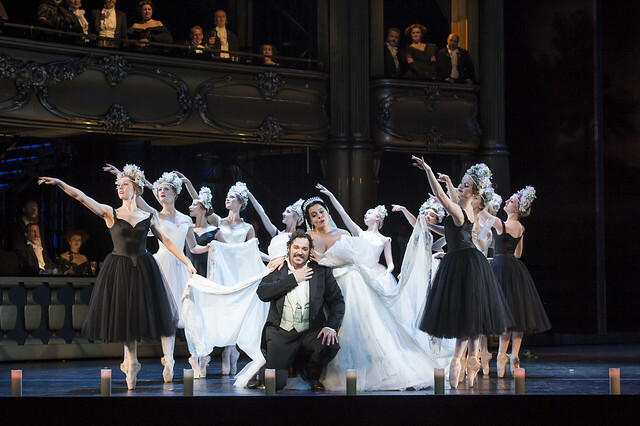 Audience responses and press reviews of The Royal Opera's performance of Verdi's spectacular work. 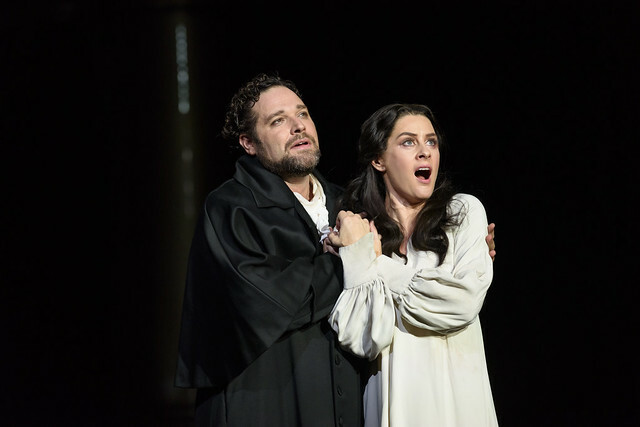 Bryan Hymel as Henri and Malin Byström as Helene in Les Vêpres Siciliennes, The Royal Opera Season 2017/18 © ROH 2017. Photograph by Bill Cooper. #ROHvepres is pretty nuts, but really rather wonderful. #ROHVêpres is one hell of a slow burner but definitely worth. It was a shame that there was some vocal uncertainty towards the end. Obviously I should get out more, because until #rohvepres yesterday I had never heard @erwinschrott. What a voice! Unforgettable. What did you think of Les Vêpres siciliennes? Add your thoughts in the comments below. Les Vêpres siciliennes runs until 4 November 2017. Tickets are still available. Loved it even more this time than four years ago. Musical and visual treat. Male leads could not be better. A shame the wonderful little boy didn't take a bow, but then I suspect it was way past his bedtime. A touch worrying if you think Schrott was playing himself while portraying a psychotic ballet master!!! Superb singing, great orchestra (as ever), great dancing and enjoyable staging. 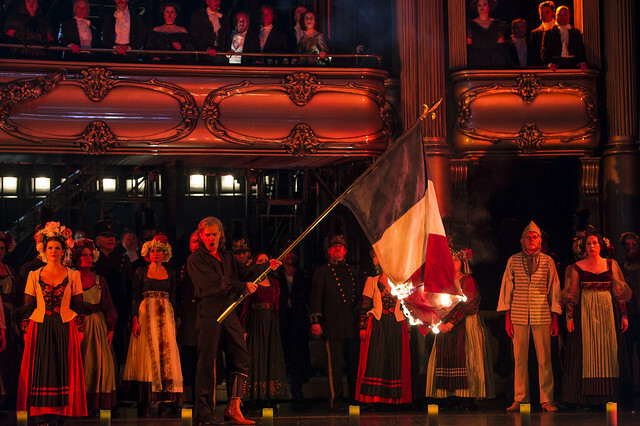 One hears about the Paris Opera and this felt like a glimpse into what Paris audiences would have experienced in the 1850's. satisfaite. Je vous en remercie. I'm surprised that more reviewers didn't comment on Philipp Furhofer's gorgeous sets, which continued to move and evolve ever more interestingly as the performance went on. Best I've seen at the ROH in recent years.. I wish he'd been hired to do the sets for the upcoming Ring cycle. An excellent (revival) production with dream casts. Powerful singing, and loved Furhofer's very imaginative and versatile sets. I can see why this opera is not seen very often but I enjoyed it and thought the singing was excellent and the production akso very interesting. Would not rush to see it again and was sorry to see empty seats sfter the first interval, as it's worth sticking with. Saw it on the 20th. Wow !!! what a cast and who sang their socks off whilst deftly side stepped the irritating dancers. Band and conductor excellent .This sort of calibre restores one's faith ! WONDERFUL PRODUCTION - One of the best so far. Could go see it again. Well Done R.O.H. Saw it this evening. Totally new to me, although I thought I'd seen all Verdi. Singing was amazing as was the conducting and orchestra. Staging was confusing and irritating with endless distracting set movements and irrelevant ballet dancers. The idea of an opera audience didn't work for me as the singers didn't "perform" to them In fact the singers seemed to want to perform in the very old style facing the audience rather than each other. I thought the ROH had left this style years ago. We think we saw this at a cinema screening in 2013 but don't recollect a lot, which having now seen it wonderfully live on the 20th goes to show the difference between being there on the night in the theatre with the spectacular singing, staging and atmosphere and a somewhat static cinema audience reception. You can't beat live - loved it! The singing was marvellous. Appalling production, handsome but meaningless. As an example, the child on stage ruined his father's aria in Act 3; a totally unnecessary distraction. The production totally alienated me and I hated the whole evening. Ballet dancers the whole evening, when they were not wanted. And yet the ballet (one of the finest items in the score according to Osborne) was cut. I will never go to see this again. As in 2013, the production irritates. Visually impressive and consistent in concept and detail, but (to me) simply irrelevant. Artists pontificating about art (except, sometimes, Wagner) rarely cast their gaze above the navel and there is nothing in this piece, or indeed in Verdi, to justify such an approach. This staging would be fine for Tannhäuser. If we have to have the Sicilian Vespers in the 19th century, what is wrong with Palermo 1860? Giovanni di Procida becomes Giuseppe di Caprera and Angevins become Bourbons. The cast is outstanding. Erwin Schrott's Palermo aria, Volle in Act 3 and the whole of the prison scene were my highlights. Stanisci seemed under-rehearsed with her colleagues at the start but soon settled. Later she seemed to relish every chance to show the breadth of her talents - in the best possible way. Volle is a good actor and does not need directorial clutter to make an emotional impact. We all know what a child looks like. In a sense, this is a very modern piece. None of the characters is entirely attractive, all of them in different ways are blinkered zealots and all are odious when they get the taste of power. Thankfully, they all know it and acknowledge it in their solos. Well done playing this in French. Can we have the French Don Carlos next please? I saw it yesterday and agree with the above comment. The staging irritated me and as above why did it not play in 186o or in the original period? Particularly the dancers irritated me. I found them absolutely superfluous. Why?! Particularly also the child was irritating. The singing was great all round, particularly Volle who has a wonderful voice and acting. I also liked Brian Hymal,s singing and the choruses. I agree the singing and orchestra were marvellous and the production handsome and on the whole I thoroughly enjoyed it even if it was an effort to see relevance in the setting. However I am still puzzled by the drag queen at the end poking people with the flag. Any suggestions for this would be most gratefully received. What a wonderful melodrama of an opera. I thouroughly enjoyed everything about it. A point of interest, having just returned from a holiday in Sicily, including a few days in Palermo, the Sicilians are very proud of their Norman heritage!